Something Else by The Kinks, often referred to as just Something Else, is the fifth UK studio album by The Kinks, released in September 1967. It marks the final involvement of American producer Shel Talmy in the Kinks' 1960s studio recordings; henceforth Ray Davies would produce recordings. Many of the recordings feature the keyboard work of Nicky Hopkins and the backing vocals of Ray's wife, Rasa. Two hit singles are included: "Waterloo Sunset" and "Death of a Clown". In 2012, the album was ranked #289 on Rolling Stone magazine's list of the 500 greatest albums of all time. As Ray Davies had assumed control over production after the departure of Shel Talmy, Something Else marked a change in the sound and production style of the Kinks. He felt unsure of his skill in mixing and recording their records and later commented, "I feel that I shouldn't have been allowed to produce Something Else. What went into an album required someone whose approach was a little bit more mundane". Apart from "End of the Season", the album was recorded between the autumn of 1966 and the summer of 1967, when the Kinks had cut back on touring and had begun recording and stockpiling songs for Ray's as-yet poorly defined "village green" project. The song "Village Green" was recorded in November 1966 during the sessions for the album but was released on a French EP in 1967 and did not appear on a Kinks LP until the next release, The Kinks Are the Village Green Preservation Society. Ray's lyrics on the album deal with English-inspired subject matter, including the harpsichord-laden "Two Sisters", the lazy shuffle "End of the Season", and the sardonic "David Watts". The album includes three songs composed by Dave Davies, including the hit single "Death of a Clown". The album sold poorly in the UK, in part because it competed with budget-priced compilation albums of early Kinks hits from 1964–1966; also, Pye Records had released "Waterloo Sunset", "Death of a Clown" and other songs before the album appeared. Something Else also sold poorly in the US upon release in January 1968 where the group was still the subject of a US ban on live and television performances. 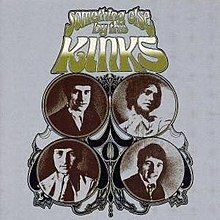 James Pomeroy, in a March 1968 review in Rolling Stone, felt it was the best album the Kinks had made to that point, praising the "humor, cynicism, perception and irony" where he felt the band are at their best. He picked out "David Watts" and "Waterloo Sunset" as the best tracks, and also praised the three contributions of Dave Davies. In a retrospective review for AllMusic, Stephen Thomas Erlewine felt that the "nostalgic and sentimental" songwriting are key, and that part of "the album's power lies in its calm music, since it provides an elegant support for Davies' character portraits and vignettes". In 2003, Something Else was ranked #288 on Rolling Stone's list of the 500 greatest albums of all time. All tracks written by Ray Davies, except where noted. ^ "Something Else by the Kinks - The Kinks - Songs, Reviews, Credits - AllMusic". AllMusic. ^ "From the Record Crate: The Kinks – "Something Else by The Kinks" (1967) - The Young Folks". www.theyoungfolks.com. ^ a b Stephen Thomas Erlewine. "Something Else by The Kinks - The Kinks | Songs, Reviews, Credits, Awards". AllMusic. Retrieved 22 February 2015. ^ Sante, Luc (25 March 2018). "The Kinks: Something Else". Pitchfork. Retrieved 25 March 2018. ^ "Something Else By The Kinks". rollingstone.com. Retrieved 22 February 2015. ^ a b James Pomeroy (9 March 1968). "Something Else By The Kinks | Album Reviews &#124". Rolling Stone. Retrieved 7 October 2012. ^ "288 | Something Else By the Kinks - The Kinks". Rolling Stone. Straight Arrow (Special Issue). November 2003. ISSN 0035-791X. Retrieved 9 November 2011.